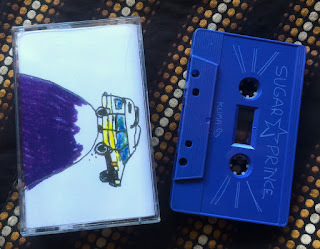 This unassumingly little “Purple Tape” is a brilliantly cinematic, dream-like stream of loose, noisy ambient vignettes wrung out from myriad acoustic and electronic devices, including, but not limited to; melodica, recorder, pre-set beats & keyboard tones* (organ & steel drum, specifically), bowed & plucked cello*, deftly-executed vintage* delay pedal, looped feedback, and drum kit, all with a lovely, soft, cloudy reverb-wash over the whole shebang, allowing drones to morph into riffs to slide into grooves to melt back into drones, and vice-versa. While managing to stay Mellow on each 15 minute side, each of these slabs of calm joy, wonder, and pause practically whiz by while exploring every single nook and cranny that those moods entail. More, puh-lease!